The Reckoning destroyed civilisation. Rising from the ashes, some people have developed unique abilities, and society is scared of them. Guided by the ancient spirits of the land, Ashala Wolf will do anything to keep them safe. When Ashala is captured, she realises she has been betrayed by someone she trusted. When her interrogator starts digging in her memories for information, she doubts she can protect her people forever. Will the Tribe survive the interrogation of Ashala Wolf? Ashala lives in a world where those with unique abilities, are forced from society into detention. History tells us the story of The Reckoning, where the world was left with nothing when devastation wiped through societies and damaged our environment. Now three hundred years into the future, the earth still continues to heal and an authoritarian society has taken the place of freedom and justice for it's citizens. Ash is the leader of an illegal Tribe, where a group of children with abilities are able to live freely within the Firstwood forest, without adult intervention. Each child possesses an unnatural ability in which the new society sees as an abomination, with those not registered with the council, are captured and tortured. Ash is with one in The Firstwood, the site where nature is said to have fought against The Reckoning and emerging with new growth and brimming with new life. The forest is alive, breathing and speaking to the Tribe. In exchange for a home to call their own, the youngsters care for the mighty Tuart trees by laying down their lives to protect the forest from the atrocities that man brought upon them centuries ago. The Saurs that roam the grasslands abide by a treaty established by the Tribe, with the giant lizards and kids sharing Firstwood peacefully. But now Ash now finds herself at the Detention Center, where she's been brought in By Justin Connor. Once part of her life, Connor was sent to infiltrate the Tribe to gather information to detain members, children who have the abilities that society seems to live in fear of. A Skychanger that once destroyed modern society through the ability to call on torrential rain, wiping out cities in her wake has left the government with no choice, bring them in and protect the planet. Ashala Ambrose, now known as Ashala Wolf, is sixteen and a Sleepwalker. At only eight years old, Ash realised that her dreams were more than just that, they allowed her to explore and experience the world. Ash ran away at twelve years old, Fleeing Gull City in the hopes to avoid the Citizenship Assessment at fourteen, as do most illegals. Those with abilities are put in detention or branded with a tattoo, and Ash wanted neither one. Neville Rose is the chef administrator at the detention center, who's reputation proceeds him. Neville expects Ash to give up the secrets of the only family she now has, after an accident had taken the lives of her parents and little sister Cassie. But Ash is a fighter, and her strength of character sees her being strapped into The Machine, designed to extract the information they want from her by force by delving into her memories. Connor isn't the only one who has betrayed Ash, as one of her own from the Tribe has been working with Neville in exchange for her freedom. Ash fears she'll never return to Firstwood, where no doubt her friends Georgie and Ember must know she's been captured and that Connor has betrayed them. But as the interrogation reveals Ash's meeting with the elusive Serpent, there are memories that dance around Ash's mind that seem just out of reach. Of Connor, who Ash seems to share a connection with. Georgie who can manipulate the mind. Ember, who can infiltrate Ash's memories as the machine seeks to find her secrets and why Neville Rose wants to destroy her. 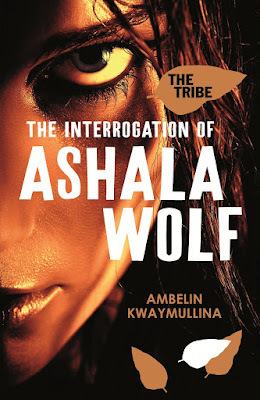 The Interrogation Of Ashala Wolf can be described in one word, awesome. This is not your average dystopian, a blend of Indigenous Dreamtime and a post apocalyptic world in which man destroyed our environment. Ashala is a tough and feisty heroine, she possesses an inner strength rarely seen in most young adult protagonists. She's socially aware and an environmental warrior, sharing a connection with both fauna and flora alike. She's given a sense of peace, stability and a home within the spiritual Firstwood forest for children like herself, who have gained abilities through evolution, possibly to aid in survival while the earth was reborn. The government see them as an abomination, the Sleepwalkers such as Ash, Rumblers who can cause earthquakes, Firestarters, Skychangers who can alter the weather and Menders, natural doctors who can heal. I loved how the storyline was set within the detention center, as the machine pulls memories from Ash's mind. Her relationships, friendships and hardships, as she leads her Tribe against what is essentially the government who believe they upset the balance in society, while protecting the fragile earth. Each character is unique and share a bond with the animals they share Firstwood with. Friend Georgie has a strange connection with spiders and can manipulate to either attack or aid, just as Ash has a bond with wolves. The spiritual aspects were beautiful and readers will appreciate the uniqueness that is Dreamtime. I didn't love The Interrogation Of Ashala Wolf, I adored it. I love your blog! It's gorgeous :) And yay for aussie blogger >.< I haven't heard of this one before, so thanks for putting it under my radar! Thanks Mel, YA Midnight Reads is one of my favourite blogs to stalk. The mixture of dystopian, science fiction and weaving the Dreamtime story throughout was magical, unique and made for an all round awesome Aussie novel. Definitely put this one on your list. Ooh I haven't heard of a dystopian based on Indigenous heritage before, sounds like you really loved this book! Thanks for sharing Kelly, glad you really enjoyed it. Me either Jeann. I remember learning a little about the Dreamtime back when I was in high school and I was fascinated. In Ashala Wolf, it's beautifully woven throughout and provides a real spiritual sense to the storyline, giving it a magical feel. This sounds like my kind of dystopian book! But I can't seem to find this one in Amazon. I asked the lovely Jaclyn at Walker Books Australia, and it should be available in a few weeks except in the U.S, where they'll need to wait until April 2014. I'll keep you posted. OK, do tweet me about it! Hooray, I'm glad you liked this book. I got given a copy of it last year and I was so excited by how unique it was, especially when dystopias are flooding the market at the moment. But the Dreamtime lore makes it so different and I love, love, love Jaz, he's awesome. He has a really great line in the second book too, which came out a few weeks ago.